Artopex offers an ingenious range of hardworking, sturdy and attractive metal storage cabinets to configure according to your specific office needs. Artopex storage cabinets are available in a variety of layouts and sizes, with or without doors, sliding doors and opening doors. Shelves are adjustable, or the storage cabinet can be used as wardrobe unit. 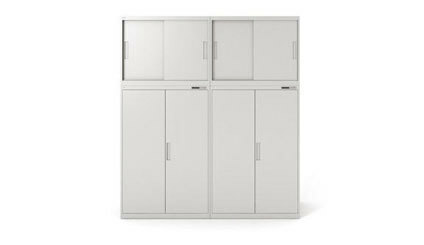 Metal storage cabinets can be full height or stackable. You can also have the storage cabinet designed and built to fit a specific size or space. Artopex is all about custom designed storage solutions to maximize the use of valuable space while staying within your budget! Artopex custom storage units are available in standard heights from 27 inches to 77 inches and widths ranging from standard 30 inches to 42 inches wide. The Artopex metal storage cabinets can also be supplied in various enamels and metallic paint finishes. Custom built storage solutions are Artopex’s specialty. It pays to select quality. Give me a call so that I can help you.